Proper kitchen sanitation and food prep practices are critical for keeping foodborne illnesses from infecting your family. The good news is that some simple know-how about sanitizing your sponges, using a microwave cleaner and proper washing will keep your family safe! Public enemy #1: your kitchen sponge. An NPR article last year helped explain a study published in Scientific Reportsthat indicated 362 different species of bacterialurk in an ordinary kitchen sponge. According to Jennifer Quinlan, a food microbiologist at Drexel University, following a few simple recommendations will keep your family safe from foodborne illness. Never use your sponge to clean up raw meat juices. Use paper towels instead. Sanitize your sponge every few days in a dishwasher with a heated dry cycle, or nuke a wet sponge for one minute in the microwave. Replace the sponge every 2-3 weeks. Instead of using a sponge, use cotton dishrags that can be changed out and sanitized in the wash every couple of days. It’s so easy to just grab an apple and take a bite, but you truly don’t know where your produce has been. Washing removes pesticides, dirt, bacteria and other contaminants that your healthy produce has encountered on the way to your house. This applies to all produce, including avocados, melons and other produce that gets peeled, since dirt from the skin can contaminate work surfaces. Root vegetables need extra scrubbing with a vegetable brush, since they grew in the dirt! Handle raw meat with care. Never use the same cutting board for raw meat and produce. The goal is to prevent the growth and spread of salmonella and other dangerous foodborne bacteria that can lurk in raw meat and eggs. Stay away from preparing meat on wooden cutting boards altogether, since the grooves and cut marks on a wooden board will harbor bacteria and require washing in soapy water and bleach for proper sanitization. 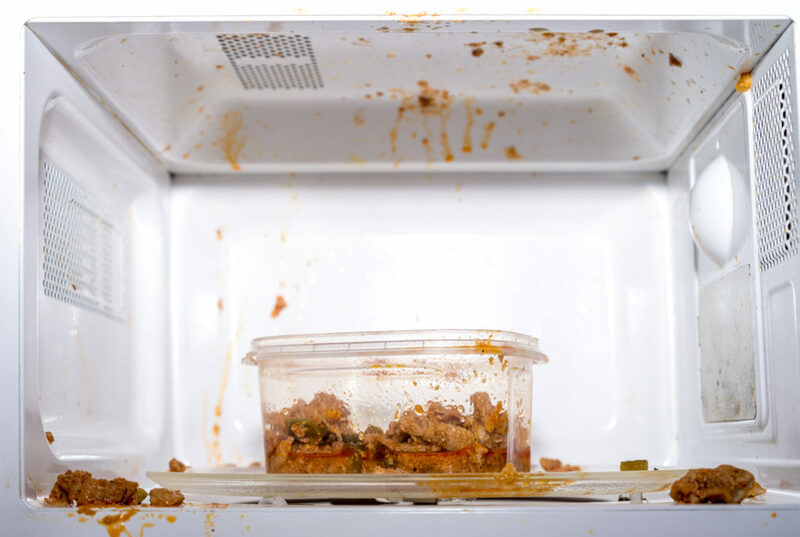 Dried-on splatters in the microwave are both unsightly and unsanitary! Use a microwave cleaner like Glisten Microwave Cleaner to clean up cooked-on spills in an environment that is often moist and perfect for bacteria growth. Cross-contamination is very easy in a kitchen, where busy hands are constantly touching faucets, door handles, cutting boards, cutlery and work surfaces. Wipe down these surfaces frequently with bacteria-killing cleansers or sanitizing wipes. When sanitizing, use disposable paper towels instead of a sponge or dishrag, which may just spread bacteria around. Just remember that bacteria lurk wherever there are dirt and food scraps, drippings and residue. Using a microwave cleaner, changing cleaning rags and sponges, and sanitizing work surfaces are all key to keeping your kitchen free from germs that cause food-borne illness.